3 Bdrm Detached Dwellhouse in app 0.5 acre. Ground flr: Reception hall. 3 Bdrms 1 with ensuite shower rm. Bathrm. Lounge. Dining rm. Dining kitch. Conservatory. Utility rm. Cloakrm with wc. 1st flr: Gallery/study area (CT band - G). Garden. Garage. Parking. Price over £550,000 Entry by arr. Viewing 01330 811903 or contact solicitors. (EPC band - E). PLEASE NOTE: An electrician has recently inspected the electrical installation and carried out some upgrading to install a modern consumer unit. Please see the up dated Single Survey within the Report section. 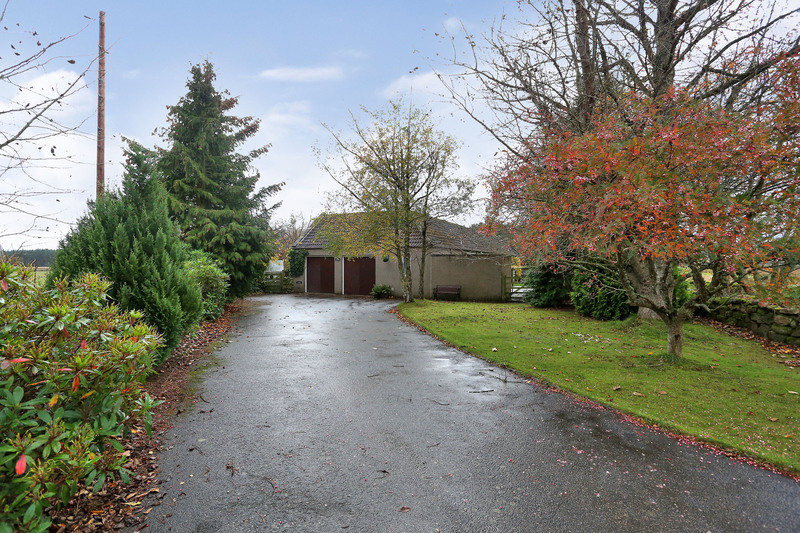 A PRESTIGIOUS AND SPACIOUS CANADIAN DESIGN THREE BEDROOM DETACHED DWELLINGHOUSE WITH DOUBLE GARAGE SET IN APPROXIMATELY 0.5 ACRES OF WELL MAINTAINED AND MATURE GARDEN GROUNDS WITH STUNNING VIEWS OVER THE COUNTRYSIDE. We are extremely delighted to offer for sale this prestigious Canadian design THREE DOUBLE BEDROOM DETACHED DWELLINGHOUSE WITH DOUBLE GARAGE boasting charming features and is set within approximately 0.5 acres extensive, well maintained mature garden grounds while enjoying picturesque open views of the surrounding "National Trust" countryside. 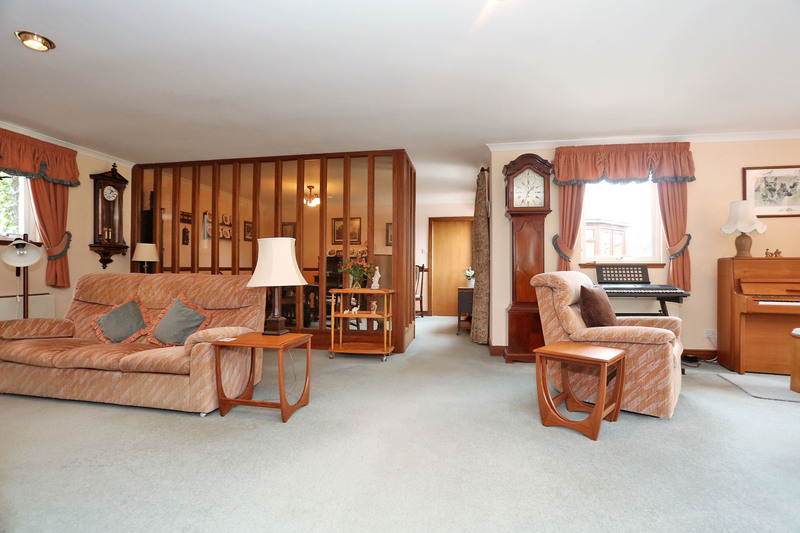 The accommodation comprises: Ground Floor - entrance hall, inner hall, extremely large lounge, formal dining room, superbly centrally appointed dining kitchen, conservatory, utility room, cloak room, bathroom, three double bedrooms (1 with en-suite). Upper floor - a galleried room currently used as a study but could be utilitsed as a child's play / TV / games room, a large partially floored loft space with light. 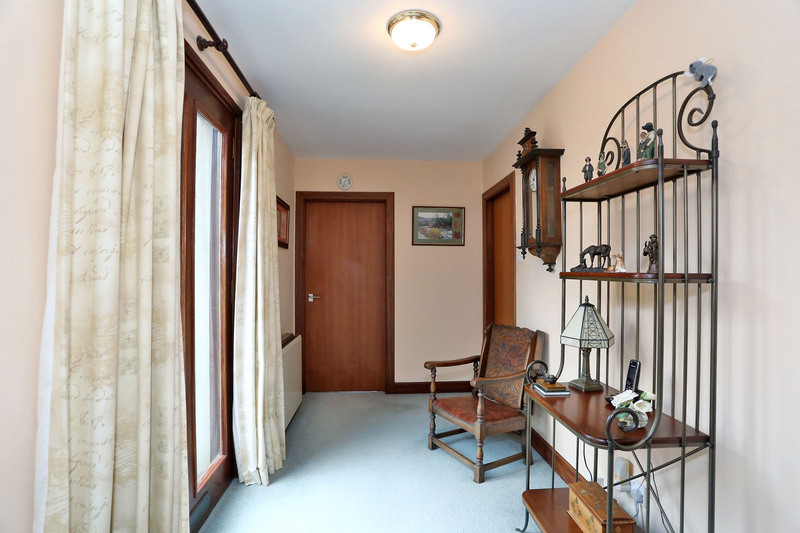 RECEPTION HALLWAY 4.15M X 2.00M approx The quality of the property is immediatly apparent on entering with attractive woodgrain doors leading to the inner hallway, bathroom and a walk in cupboard which houses the hot water tank, electric meter and fuse box. A door provides access to the spacious lounge. INNER HALLWAY 5.47 x 1.85m approx The inner hall is flooded with light from a full height glazed wall. From here access is provided to the three bedrooms and a stylish stairway leading to the upper floor. 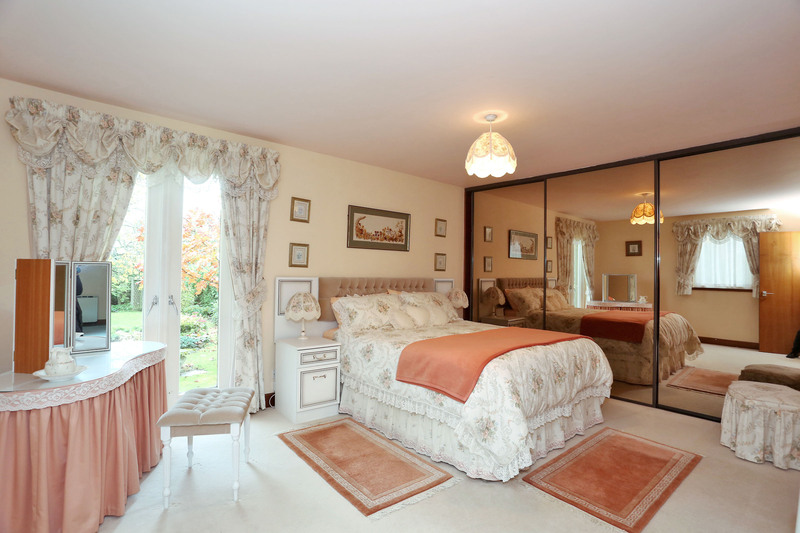 MASTER BEDROOM 4.84m x 4.14m approx A bright and generous sized room with French doors leading to the rear garden and enjoys superb views over the Dee Valley and surrounding countryside. The room is fitted with two large built in wardrobes with tinted mirror fronted sliding doors with a central door leading to the en-suite. 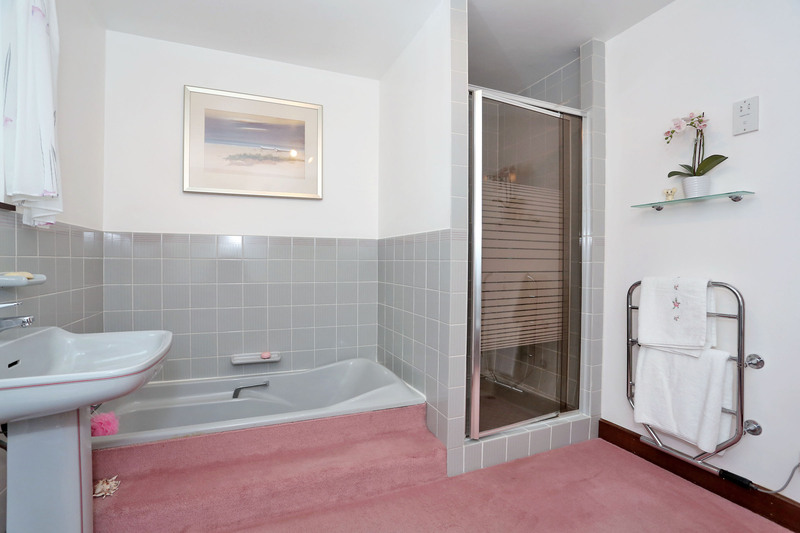 EN-SUITE 2.50m x 1.20m approx Fitted with a three piece suite comprising; WC, wash / hand basin, a tiled shower area enclosed with a glass door and fitted with a mains shower within. Adjustable lighting with the three track spot lights. 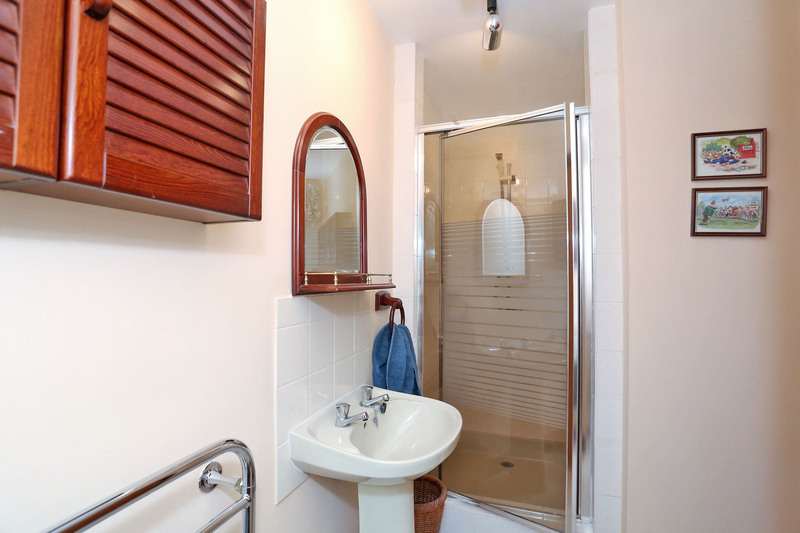 The room benefits from a chrome heated towel rail, a shaver point and an overhead heater. 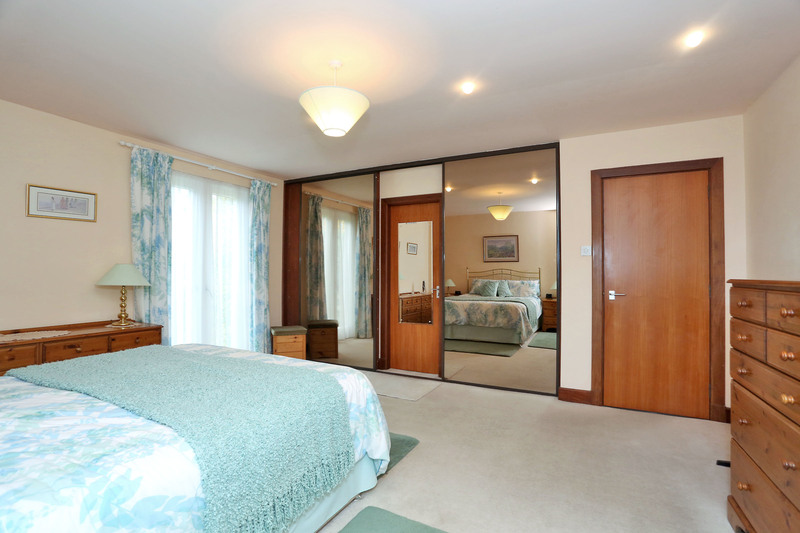 BEDROOM TWO 4..62 x 3.46m approx A large double bedroom with a built in wardrobe with triple mirror fronted sliding doors. The room has lots of natural light flooding in from French doors which lead out to the front garden providing a superb view to the South. 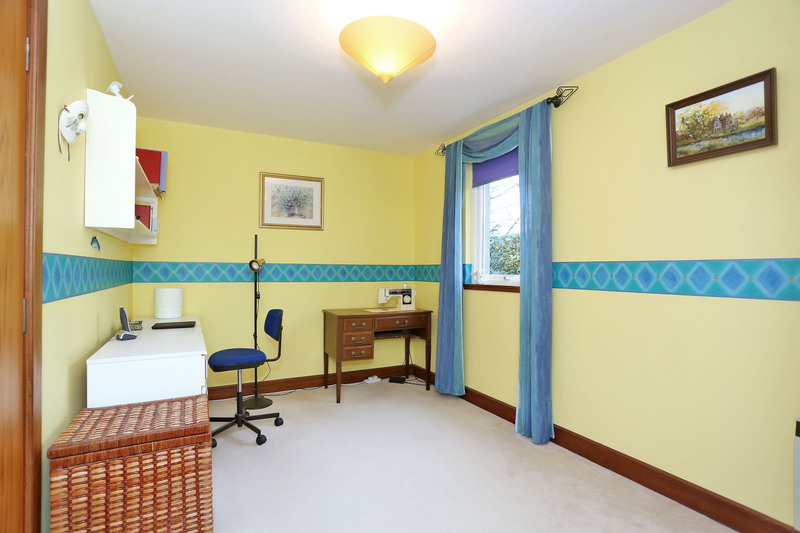 BEDROOM THREE 4.06m x 2.61m approx Another good sized and well proportioned double bedroom and is currently used as a craft / work room. The room also benefits from a built in cupboard which provides hanging rail and storage. 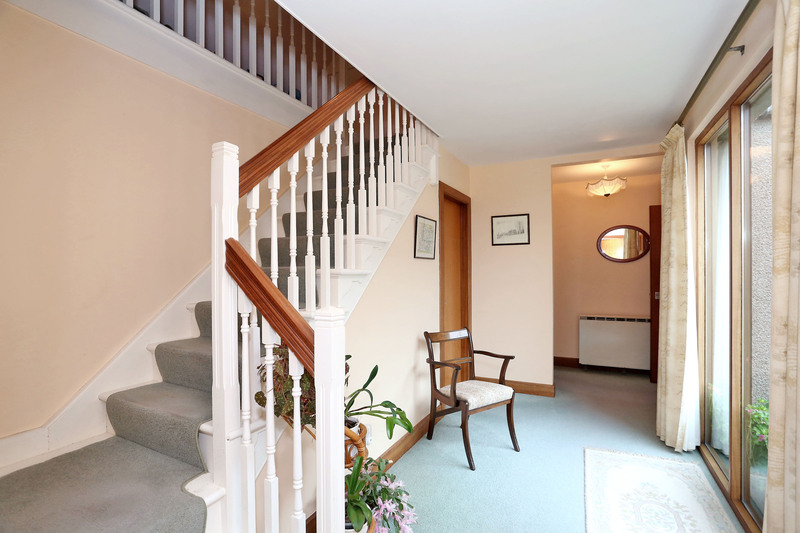 GALLERIED UPPER HALL/STUDY AREA 7.49m x 3.86m approx The stylish staircase leads to the gallery area which is currently utilised as a study but would be also suitable as a childs play area or a TV / games room, etc. 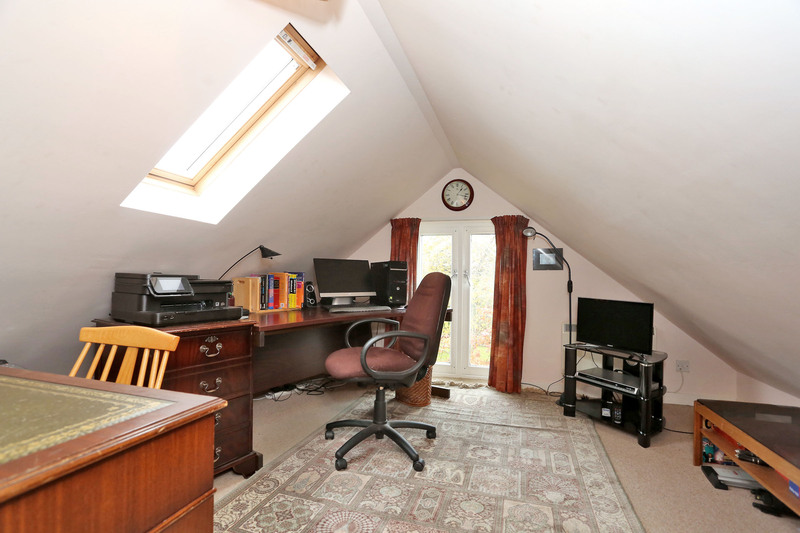 Although this room is of restricted head height due to the eves of the roof it is still a very useable room. There is a Velux sky light and attractive and petite French doors. Access is provided into the extensive and partially floored loft space which runs the entire length of the house and provides an excellent storage space. BATHROOM 3.00m x 2.75m approx Returning back to the reception hallway is the family bathroom which is of generous size and is fitted with a four piece suite by "Ideal Standard" and comprises; WC, bidet, single pedestal hand / wash basin, sunken contour bath and a shower cubicle with a mains shower within. 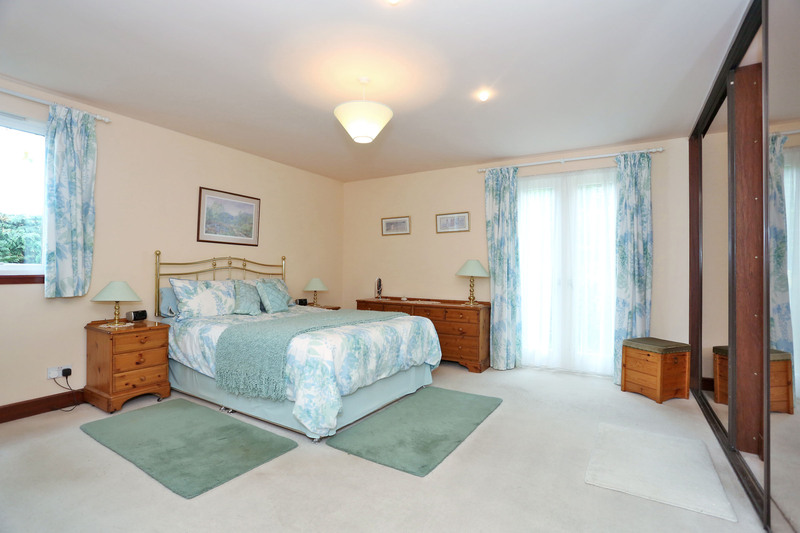 The room has inset ceiling spot lights, a shaver point and additional heated towel rail. LOUNGE 8.75m x 5.47m approx Leading from the reception hallway into the magnificent and spacious lounge which certainly has the "WOW" factor. This room has cleverly been designed by visually dividing the room into two areas of different styles. 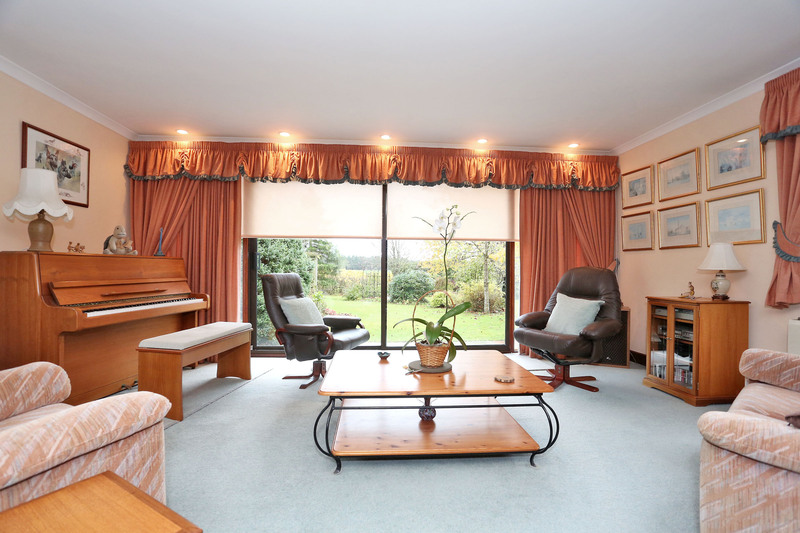 The South part of the lounge has a wall to wall and floor to ceiling glass wall incorporating large double patio doors providing a striking and magnificent panoramic views over Deeside. The North half of the lounge has an elevated granite fire place with a "Gazco" gas fire installed which provides a cosy and warm atmosphere. 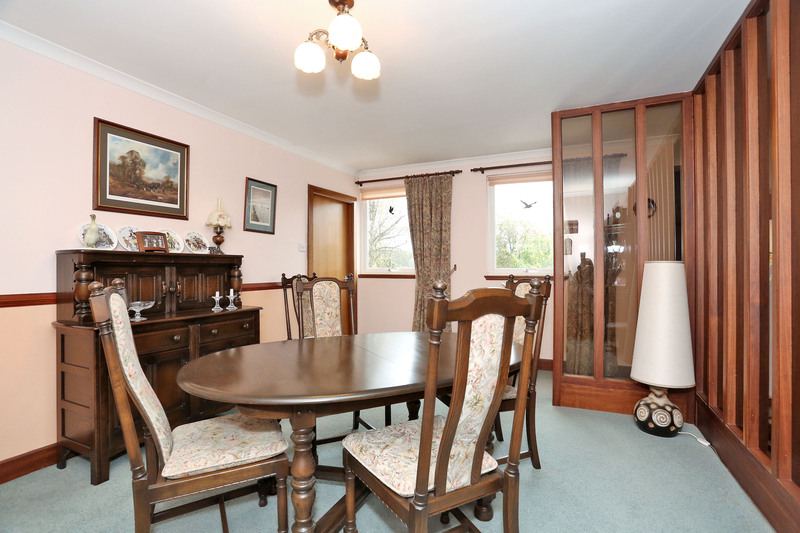 DINING ROOM 4.82m x 3.48m approx Flowing from the lounge into the well proportioned formal dining room which has a glazed dividing wall from the lounge. KITCHEN 4.75m x 4.70m approx A very spacious and well appointed kitchen which was thoughtfully designed and fitted with top of the range "Crosby" wall and base units in light oak with two glass fronted display units and an additional large central island and benefits from under cupboard lighting. The Corian granite effect worktops accompany the white tiled splash backs. The base units incorporate an integrated Belling electric hob with an AEG extractor hood over which is fan ducted to the outside. A white 1.5 bowl sink with mixer tap and a waste disposal unit. 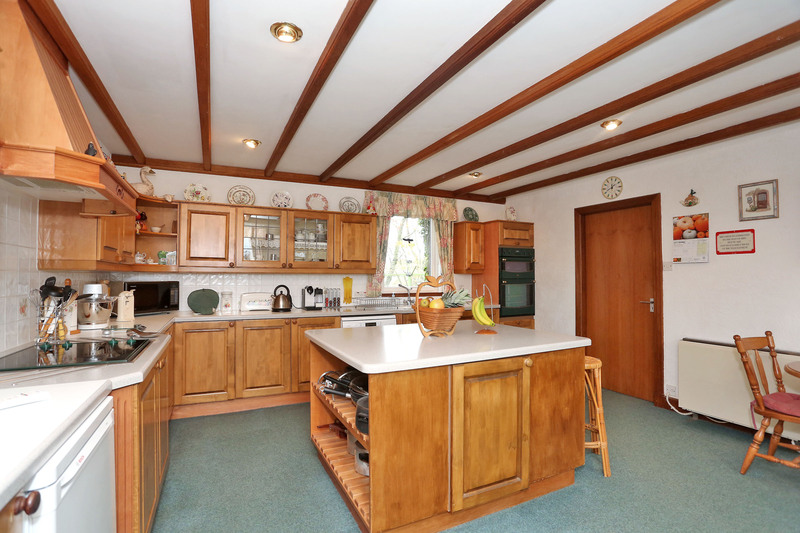 An integrated high level grill and 1 1/2 oven with storage cupboards above and below. There is ample provision within the base units for a fridge and also plumbing for a dishwasher. 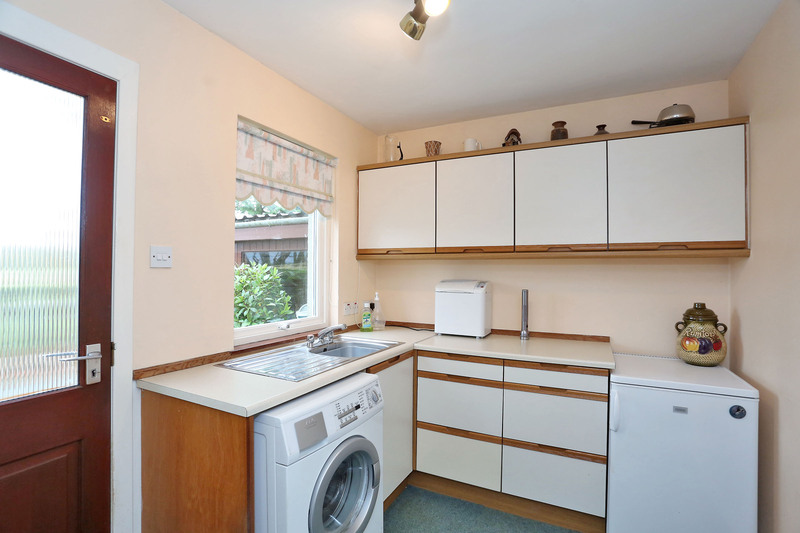 The useful central island incorporates two storage units, a wine rack, slated area for saucepans and a small bookcase. 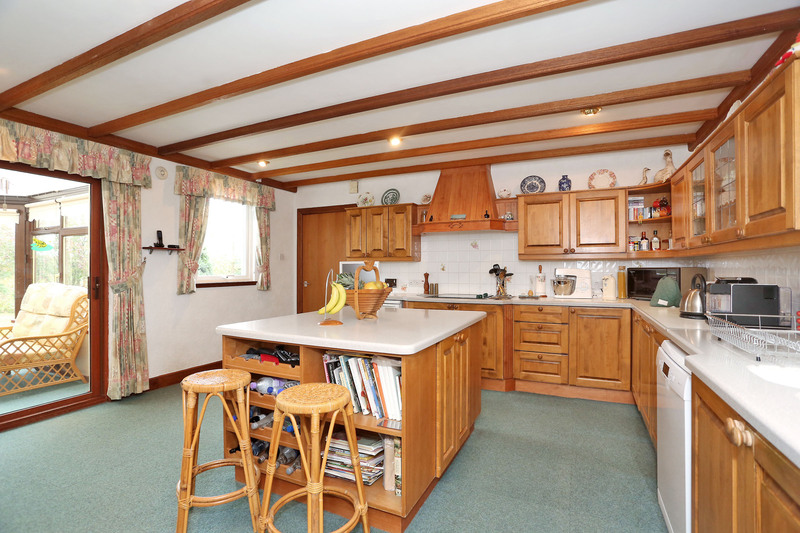 The arrangement of the kitchen allows ample space for table and chairs for dining. The kitchen provides access via double patio doors into the conservatory and an additional door leads through to the utility room. 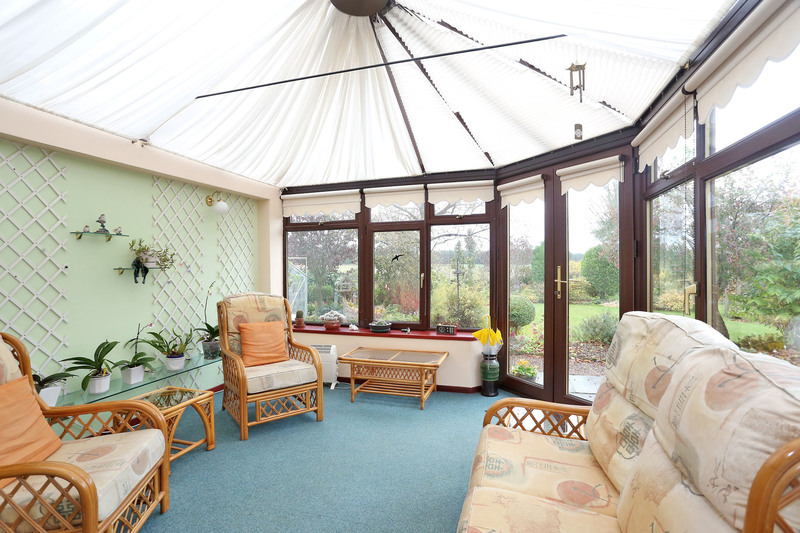 CONSERVATORY 3.70m x 3.64m approx A well proportioned and well presented conservatory with an outlook over the front garden with additional double doors leading out to the immaculate garden. UTILITY ROOM 4.09m x 2.23m approx A well designed room with wall and base units and under cupboard lighting incorporates a stainless steel sink and has ample provision for under counter space for a freezer and also plumbing for a washing machine. Doors lead to the garage, a cloakroom and an exterior door leads out to the paved area to the rear and also a walk in cupboard which has a hanging rail and shelving. CLOAKROOM: 2.46m x 1.00m approx The convenient cloakroom has been fitted with a WC and a hand basin. GARAGE: 6.20m x 5.41m approx Direct access from the utility room into the double garage which is of concrete block construction, concrete floor, plaster board ceiling and electric up and over doors. The garage provides ample space for two vehicles and has a South facing window, strip lighting, metal shelving units and a work bench (which will remain). Off of the garage is a workshop / store room (2.49m x 2.35m approx) which has adequate power points. GARDEN: The welcoming tarred driveway with appealing landscaped borders has parking for several cars and leads to the house. a wooden gate to the side of the garage provides access to the beautifully landscaped front garden and a path leads to the front door. 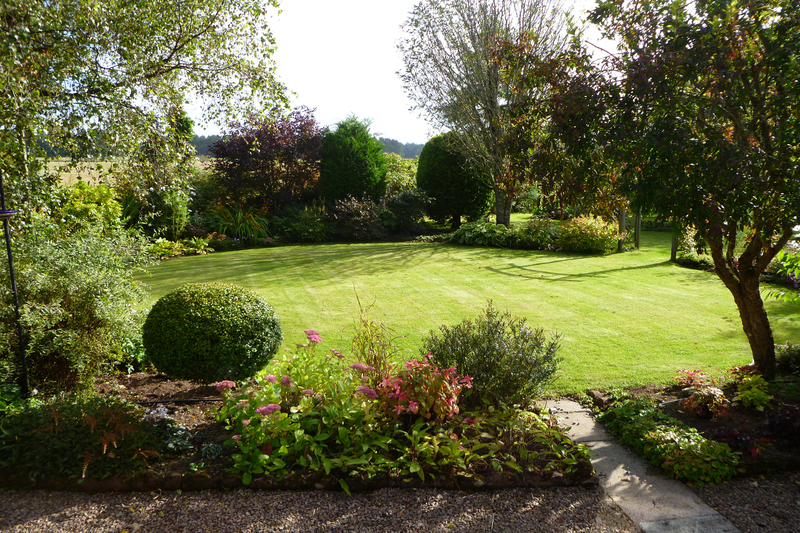 The garden is mostly laid to lawn with an aray of mature trees, shrubs and flower beds with a South facing paved area. 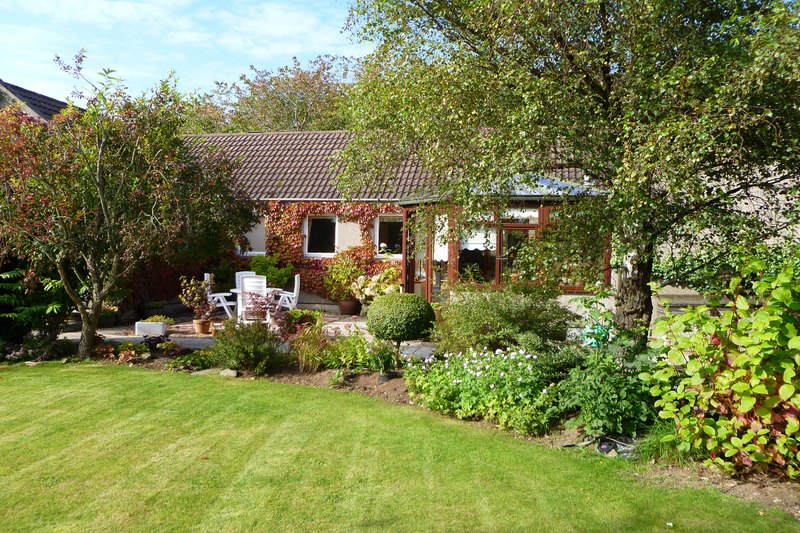 The garden is enclosed by fencing, hedging and drystone walls and offers an attractive outlook. The garden has a greenhouse (that will remain), a pond with a small water feature. 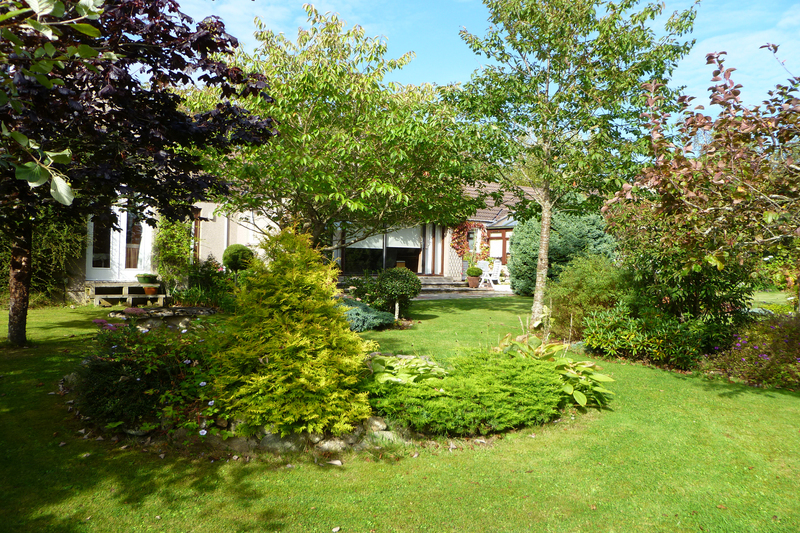 The enclosed rear garden has a large patio area suitable for alfresco dining and entertaining. A large garden shed has light within and provides excellent storage for lawn mower and other garden tools. 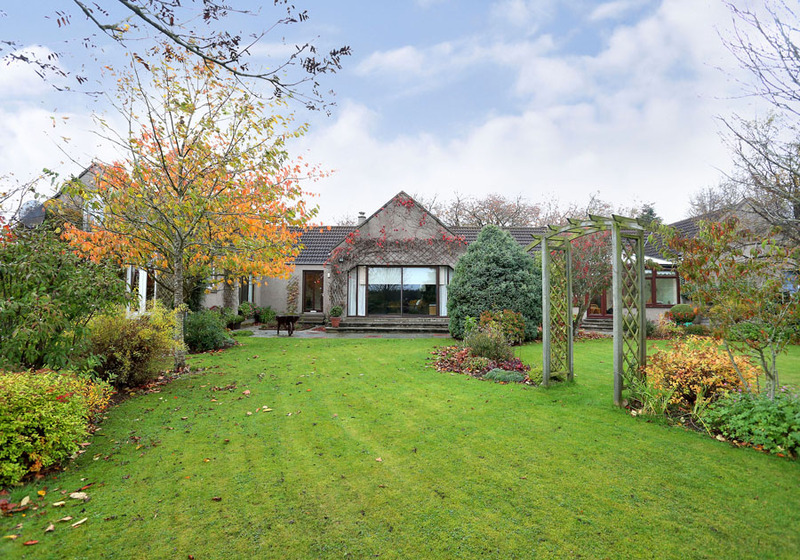 Generous off-street parking on the driveway to the front of the property which leads to the double garage, whilst the remainder of the gardens are laid mainly to lawn with mature trees and shrubs providing an ideal environment for children, pets and for outdoor relaxation. WELLHEAD, DRUMOAK Wellhead is situated approximately 14 miles from Aberdeen and 4 miles from Banchory where you would find a good range of shops and restaurants. 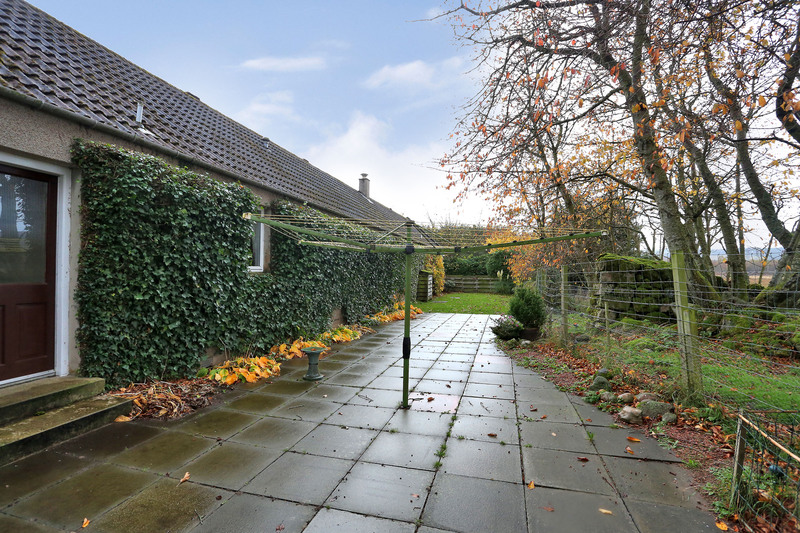 The nearby village of Drumoak provides the essential local amenities including a convenience shop serving everyday needs, a public house, church, and a bowling green. Crathes Primary School is situated within the village, while secondary education is provided at Banchory Academy. Private education and the International School are available in Aberdeen. 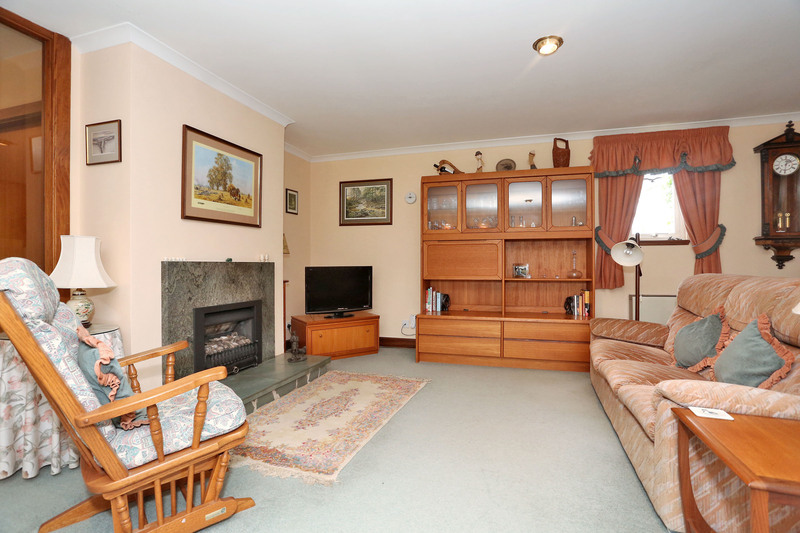 Ideal location for the sports enthusiast with a range of outdoor leisure pursuits including skiing, mountaineering, hunting and fishing available on Upper Deeside. DIRECTIONS From Aberdeen travel on the North Deeside Road travelling through Cults, Bieldside, Milltimber and Peterculter. On entering Drumoak proceed through the village and turn right at the road sign marked "Cullerlie 3 1/2m". Travel along this road for approximately 2 miles until reaching the sign marked "Candglirach / Hirn", on the left hand side. Proceed along this road for approximately 1 mile and "Wellhead" is situated on the left ahnd side of the road.